Does your little one know how to run the show? Well, sometimes it can seem like it. Use a little imagination and you might be able to tell yourself that Jake the cat is napping in the sun on that stool because your ringmaster daughter told him to "stay there!". A little imagination can convince your daughter and her friends that they've got their very own circus. How different is jumping rope from jumping through hoops? Walking the balance beam at the park is a little like tight rope walking. And if you swing high enough and close your eyes at the top, isn't that a little like swinging on the trapeze. All you have to do is make some popcorn and an everyday playdate could become a big top adventure. Make the vision complete with the right Halloween costume this year! This ringmaster costume is sleek with rich colors, textures, and gold accents. The jacket has broad cuffs, a wide collar, and an elegant peplum that splits into tails. The jacket secures with gold buttons and a braid loop, over a diamond-patterned vest. The tops are paired with a top hat, black pants, and a baton to make sure the show stays on track. This look is both fun and fabulous, which makes it perfect for girls who still like to play but are growing up faster than you'd ever believe. 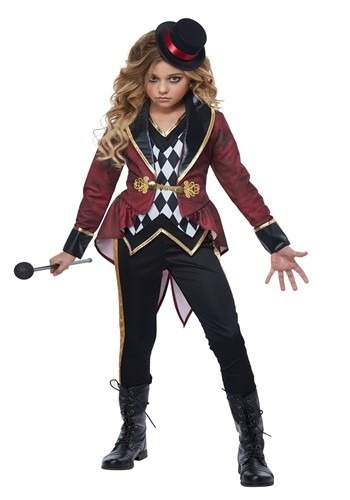 If your little ringmaster wants to go trick-or-treating with siblings that match her look, we've got plenty of circus costumes to match this one. From clowns to lions and even a strongman, kids of all ages can join her traveling show. The best part? This ticket only costs a couple pieces of candy. That's a pretty good deal if you ask us!